These days, temperatures around the world have drastically changed, which has created a great danger for the world itself. In olden times, we Kagyupas [of the Kagyu lineage] would stay only in remote mountain retreats in caves or stone huts—pleasant retreats—and there was no need to do such work as excavating the ground, cutting a lot of trees, or quarrying. But later, whether it was their increasing activity to benefit beings and the teachings, or whether it was because, as the saying goes, “The more you meditate on Mahamudra, the more active you become,” Mahamudra mediators got too busy. (2) Those who were supposed to be following the path of the Practice Lineage in the high, rocky, snowy places could not manage to do that. They came down into the valleys, and it became necessary to build many monasteries. Nowadays, many Kagyu monasteries say, “We’re making a new monastic building”, and without any compunction cut down all the trees or forests that grew naturally around the site. This can create great harm for the environment. Some monasteries are even selling timber from forests behind the monastery. When we do that, we don’t know what harm we are creating now, but it creates problems for the whole environment a few years later. When the so called essence of the earth, the essence of the place, is harmed, it causes great harm to the environment. And then we think, “Oh, no! What did we do?” But if we only think about this later, it’s too late. It takes twenty or thirty years to grow a single tree; it doesn’t grow as soon as we plant it. For that reason, we need to understand clearly in all our monasteries in India, Nepal, Tibet, and elsewhere that if we are unable to conceive of all sentient beings throughout limitless space, that’s not so important. But we live on this Earth, and everyone can see it. If our Earth is destroyed by climate change, there won’t be any of us Kagyupas left. There won’t be any Karma Kamtsang. We’ll all be lost. It’s not the case that our Dharma protectors and Mahakala Bernakchen will save us; that the rest of the world will be destroyed and only we will be left. (3) That won’t happen. That’s why we need to protect the environment. We should provide education in the monasteries about how to do so. We should not just always dig and build, but also do something to protect the environment. The sacred scriptures, the Sutras and Tantras say that keeping monasteries and sacred places clean has immeasurable benefits. It is the same with the Earth: the Earth is in great danger and it needs our care, so we should try to help protect the environment for all the beings in the world. Even if we can’t do anything else, it is not too difficult to explain the basic things we need to do to protect the world. You should educate people about this and say, “This is how it is.” Whether we are members of our own community sangha or lay people, if we take interest in protecting the environment every single day, it will be very good. Most of us gathered here today, whether we were born in Tibet or not, have connections to Tibetan Dharma, culture and language. Likewise, most of us gathered here come from India, Nepal, Bhutan, and Sikkim. For this reason, all of us need to give some thought to protecting the environment of Tibet in order to protect our own. This is because most of the drinking water in about eight Asian countries, including India, comes from Tibet. If Tibet’s environment is damaged this presents the danger of great harm to Asia. If the water ecosystem in Tibet does not function properly, it will cause many problems like the floods downstream along the Yangtse River. When these great rivers burst their banks, there is tremendous damage, floods and other dangers. Now the Chinese government plans to plant forests in Tibet. India and other countries are also taking a big interest in the environment of Tibet, because this is a crucial issue. Whenever we open our mouths, we say that Tibet belongs to the Tibetans, but what are we Tibetans doing for Tibet? Are we protecting Tibet’s environment or are we destroying it instead? Traditionally, Tibetans have held certain ancient beliefs. If there was an impressive mountain, we considered it the abode of some spirit—so it was a revered place no one should disturb. If there was an impressive forest, or a boulder or cliff with an unusual shape, that was also a spirit’s residence. This belief was quite helpful. When I was young, we did not dare go out to play on the revered mountains where local deities lived. Forget about disturbing them—we did not even dare to walk there. We also were not allowed to put our hands in the streams that provided drinking water. This was to keep from polluting them and angering the Nagas. (4) If we had to wash our hands or feet, we had to draw some water from the stream and wash elsewhere. We were not allowed to wash, bathe, do laundry, or use any chemicals in the stream itself under any circumstances. There were similar traditions more or less everywhere. Nowadays many people, especially the young, say, “That’s just blind faith. That’s just religious belief.” The protection of the environment these traditional views provided is decreasing drastically. The traditional way of seeing things is gone, but has not been replaced by contemporary education about environmental protection. In Tibet, the main focus now is economic development and getting rich. People wonder whether to run a factory farm, build huge houses, or buy cars. That is the prevalent mentality. Nowadays, they use an awful lot of wood to build beautiful, Tibetan-style houses—a lot more than they used to. Formerly, only monasteries would have such carving and decorations; but nowadays many ordinary people’s houses have fancy carved windows, door frames and so on. It seems lovely, but it wastes a lot of wood and stone. If all the forests are used up, there is nothing to hold back or channel floodwaters; there is nothing to contain earthquakes. Now there is also much factory farming for meat. This did not exist previously in Tibet; it was not a necessity. Nowadays factory farming is easy work—there are factory farms for hogs, chickens, ducks, and cattle. They give injections to the animals to make them fatter, and use a lot of drugs. Factory farms are getting bigger, and all this livestock produces a lot of manure and methane, which fouls the environment and the pristine air. We need to really think about all this. Tibet, the roof of the world, is clean and pure. It is our own beautiful country. Even if others cannot protect it, we must keep from ruining it ourselves. If we take good care of it, we Tibetans will not have wasted our honor and responsibility. We have already lost so much of what we had, and if we destroy more of what we have in our hands, there will be nothing left you can call Tibetan. Even if there were an agreement and we could gain freedom for Tibet, what kind of homeland would we return to? We will have ruined it. If we turn it into an ugly wasteland, gaining freedom will not help us gain happiness. One reason all this happens—and it is our own fault—is that we do not have much interest in education. The more interest we take in learning about the environment, the more we will cherish and care for it. Tibet has a wonderful environment—encircled by snow mountains so that it is protected from external pollution. It is our responsibility that everyone becomes educated and protects the pure, clean natural environment there. We must all protect the environment of the entire world for the future; and in particular Tibet and the Himalayan range. Tibet is probably the most important source of drinking water in the entire world. We must consider this, especially within each of our monasteries. I think it would be very good for any monastery in India, Nepal, or Tibet to organize interest in environmental protection. I am not an expert on environmental issues, but there are a few points we should understand and follow. If you can practice these in your monasteries and provide education to the monastics and householders associated with your monasteries, it will bring benefit to us as communities and individuals. The first point concerns automobiles. It often happens that as soon as a lama completes a 3-year retreat, he buys a truck. We had a little novice monk at Tsurphu, and someone asked him, ‘What do you want to do?’ He replied, “I want to become a lama.” “What will you do when you are a lama?” “I’m going to do a 3-year retreat, buy a truck and Karma Chakme’s Toh book, and then I’ll travel.” (5) He had seen lamas doing this. So this is what little children think lamas do. Each lama buys his own car, and has to fuel it. As world oil supply diminishes, the price is increasing continuously. So why do we need separate cars for every lama? Everyone wants a fancy car that uses a lot of fuel, or they do not feel like they have the status of a lama. I have to wonder how this accords with the lives of those earlier masters, who exemplified having few desires and being satisfied with what one has. Lamas are Dharma practitioners, whether or not they are monks. That means they should be people with few desires who are content with what they have. They should not chase directly after the eight worldly dharmas of this life, although things might come to them naturally. (6) These days it is not like that. There is a problem. We need to rethink whether we should buy so many cars, especially those that use a lot of fuel. We should practice restraint. It is also negative from the local people’s point of view. Most of us here in India are refugees. The local people will be jealous that we drive fancier cars than they do. It does not look good. It is unnecessary. The second point is that in remote areas of Tibet, people are using solar and wind-powered electricity. This is good. It is expensive to generate electricity, and using it without caring about environmental impacts is destructive. At our monastery in Tibet, Tsurphu monastery, there was no electricity, but then they installed solar panels. Solar panels are still quite expensive. It can be very expensive to provide the amount of power to cover a large building. But solar and wind power are beneficial because they do not have operating costs, and they do not harm the environment. In Tibet, the sun shines strongly—it is the roof of the world—so many people there do use solar electricity. In our monasteries, we are big groups of people, and we have large electricity bills. Since we are already paying for it, we should think about how to conserve electricity. Do not pointlessly leave lights on all the time when the sun is shining and the weather is bright. The third point concerns growing trees. We bhikshus [monks] are not allowed to cut down trees or any other plant that has roots and bears fruit. This is the vast intent of the Lord Buddha. But not only bhikshus; all of us must keep this in mind. The oxygen for all the living creatures in this world comes from trees and plants. So if we can plant even one tree, it will probably help a great number of creatures survive. Sometimes I even think it would be better to plant a single tree than to perform a life-release for many beings. Last year I talked about performing life-releases, giving up eating meat and becoming vegetarian so as to increase the life-spans of HH the Dalai Lama, myself, and many of our lineage lamas who have become elderly, so that they might continue to be with us for a long time. This year I think it would be good for each of our monasteries to plant a thousand trees, if not more. When I say plant, this does not mean that it absolutely has to be done right near the monastery. You can make connections with groups that plant forests or help someone who is planting trees. This is for monasteries that have the resources to do so. If you don’t have the resources, that is another matter. However there are monasteries that have some wealth and want to do something for their lama’s long life. My particular recommendation for this year is that it would be good for each monastery to plant at least one or two thousand trees. If monasteries cannot, the monks can plant the trees themselves. Sponsors would also be most welcome. Most monks don’t say they have much money, and I don’t know where they spend what money they do have. It would probably be good if we could make a beautiful green forest for the benefit of all living creatures, especially in Tibet. Tibet has a huge area, so we could plant as many trees as we want. If monasteries have to cut trees, then it would be good for them to plant more than they cut. Cutting trees without replanting is the one thing that would anger the local deities and Nagas, if anything would. The fourth point is one that is not our responsibility as monks, since monks do not farm. But when farmers grow crops, they use various kinds of chemical fertilizers to make the crops grow quickly. When they do this, the first crop grows extremely well, but after it has grown, the soil loses fertility and becomes like sand, I have heard. The chemical fertilizers exhaust the soil. This is how it happens. There are many farms in Tibet. When we plant our crops, we should not think that this is our own field and we can do whatever we like. That is one thing to think about. The other is that the use of chemical fertilizers is exhausting the fertility of large areas of cropland. Monks do not need to work in the fields themselves, but they have many friends and relatives who do. Unless we use our overall, collective effort, it will be difficult to protect the environment. In brief, for the human race, there are two conditions in this world that can make us advance. The first condition is to go forward out of fear. All beings, including animals, will advance out of fear. They sense a danger to their existence, feel fear and terror, and find a way to remedy their situation. But I think moving forward because you see a benefit or profit is probably something that mainly we humans do. We humans are beings with brains and intelligence. But while we have these brains and intelligence, if we just hang out without doing anything meaningful, then there will be another mouth to feed, another person using up space, another body crowding the world. There will be no benefit at all. While living in the world, we need to demonstrate intelligence and define our vision for the future. I think that only then will our existence in the world be meaningful. We will no longer just be taking up space. We will be able to benefit the other creatures who live with us on this earth. Protecting the Earth’s environment is a big issue in the world now. But that is not why I am shivering on this throne talking about it. Lord Buddha and many of the earlier learned and realized masters who followed him made prophecies a long time ago about how the times would become degenerate: the environment would degenerate, and beings living in it would also degenerate. These are things the earlier masters said, but we do not pay attention to them. People just talk about how it said this here and that there. I want to tell you a story. During the upheavals in Tibet in the 1950s, the previous Karmapa incarnation of Pawo Rinpoche was looking through the prophecies of Guru Rinpoche, and thought, “This probably is going to happen.” He showed them to his steward and said, “This is going to happen. These are prophecies of Guru Rinpoche. We need to flee into exile; we cannot stay here.” Whenever he showed these to his steward, the steward would say, “So it is! Let us take refuge!” The steward would touch them to his forehead and then he would put them aside. Later the situation got worse, and even the Karmapa went to India. When Pawo Rinpoche heard about that, he said, “The prophecies predicted this! Even the Karmapa has gone. We had better go, or what will happen to us?” The steward replied, “How can that be? There are the three great monasteries of Sera, Drepung, and Ganden, and the Tibetan government palace of the Potala. It is not easy to leave. If you prepare to go, you will ruin any chance of staying.” He absolutely refused to do anything about leaving. Either he was not educated or he was complacent because he had never faced such difficult circumstances. In the end, the steward was unable to come to India and suffered terribly. He was sent to re-education camps where he was tortured, beaten, and eventually died. It is similar with us. Lord Buddha and earlier masters said a great deal about how we need to protect the environment, the forests, and the trees. But when we hear it, we just touch the text to our foreheads and say, “I go for refuge!” Eloquent and beautiful words often pass our lips: “May it be so! May there be benefit for all! May it happen! May this be for all sentient beings throughout space! May that be!” But we do not practice them in a meaningful way. 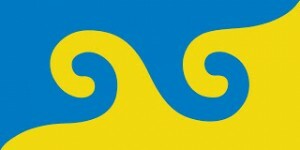 We are still wandering in the ocean of samsara suffering, because our wishes and our actions go in opposite directions. If we continue in this way, we will remain in samsara forever. Please keep this in mind. (1) His holiness is referring here to the various lineages in Tibetan Buddhism. His lineage is Kagyu Monlam Chenmo, although it can be shorted to Chenmo. See the lineages website for further information. (2) Mahamudra is the body of scriptural teaching sacred to a lineage. This Wikipedia article gives a good summary of the concept. (3) Mahakala Bernakchen are the personal protectors of the Karmapas. See this Himalayan art site for a definition and also interesting illustrations. (4) Nagas are half-human, half-divine gods, usually taking the form of a snake. (5) One of the greatest spiritual masters of the Kagyu lineage, Khenpo Karthar Rinpoche’s Karma Chakme’s Mountain Dharma was a spiritual text that the 16th Karmapa brought into common use for the training of monks. (6) A useful discussion of the eight worldly dharmas can be found at this link. EDITOR’S NOTE: Karmapa Orgyen Thinley Dorje is the head of the Karma Kagyu tradition, and the 17th incarnation of the first Tulku in Tibetan history, the Gyalwang Karmapa. 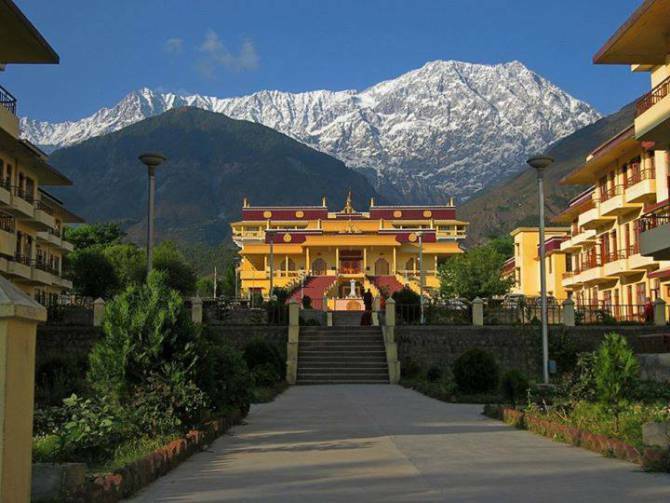 He presides over more than a hundred monasteries scattered across the Himalayas, Europe, and as well over a U.S. temple in Woodstock, New York. 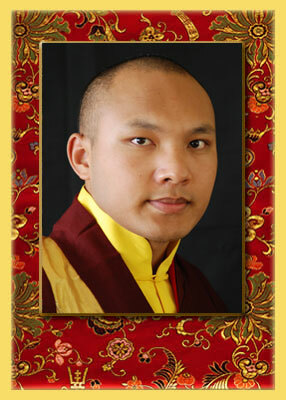 He was born in 1985 to a Tibetan nomad family, and by age 10 was recognized as the Karmapa. At the age of 14, in early 2000, he made a daring escape from Tibet to India and since then has lived near Dharamsala, the seat of the Dalai Lama. He has stated that his special mission is preservation of the environment. This article is the transcript of a speech given at the Kagyu Monlam in Bodh Gaya, northeastern India, one of the sacred sites of Buddhism. It was translated by Ringu Tulku Rinpoche & Karma Choephel, and is courtesy of kyoryug.com. Please consult their website for further biographical information about His Holiness, and news, bibliography, et al.